Originally published in 1973. 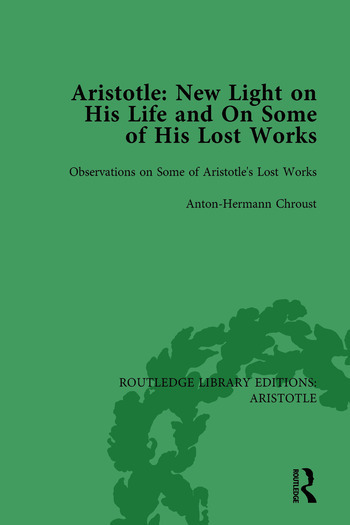 Aristotle’s early works probably belong to the formative era of his philosophic thought and as such contribute vitally to the understanding and evaluation of the development of his philosophy. This book shows that the philosophy propagated in these lost works indicates an undeniable Platonism, and thus seems to conflict with the basic doctrines in the traditional treatises collected in the Corpus Aristotelicum. Was the author of the lost early works and the later preserved treatises one and the same person, or were some of these treatises written by members of the Early Peripatus? This, the second of two volumes, discusses in detail certain decisive aspects of Aristotle’s early works. Fascinating hypotheses and conjectures put forward here provoke discussion and further investigation in the ‘Aristotelian Problem’.